Justin Bieber is accused of attemped robbery, according to the LAPD. Magic Johnson's advice for L.A. Clippers owner Donald Sterling. A Turkish mining disaster claims more than 200 lives. And could Justin Bieber be ringing up trouble again? Disrespected: Magic Johnson has some advice for Los Angeles Clippers owner Donald Sterling: Sell the team, take the money and enjoy the rest of your life. The former NBA star appeared last night with CNN's Anderson Cooper in an exclusive interview. It came a day after Sterling's own interview with Cooper and one in which he questioned Johnson's community outreach efforts. Johnson said the 80-year-old billionaire disrespected him by questioning his charitable work. Sterling is embroiled in a controversy over racist comments that earned him a lifetime ban from the league. Desperate situation: More than 200 people were dead after a transformer exploded in a mine in western Turkey yesterday. About 90 miners have been rescued, but the fates of more than 200 others were uncertain. The prime minister's office has declared three days of national mourning. Bieber, Gucci Mane and Baldwin: Our buddies in showbiz are in the news again. 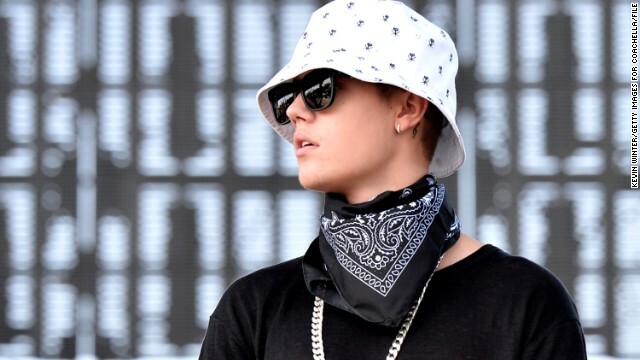 Justin Bieber has been accused of attempted robbery. The alleged incident involves a cell phone. Details are sketchy. Rapper Gucci Mane cops a plea deal to save him more serious jail time. Instead of serving up to 20 years on a pair of federal firearms charges, he'll do a little over three years. And actor Alec Baldwin got busted for riding his bike the wrong way up a New York street. The "30Rock" star got so upset with police over the incident, he also earned himself a disorderly conduct summons. More cases? : Two health care workers went to the emergency room with flu-like symptoms after coming into contact with a patient confirmed to have Middle East Respiratory Syndrome, or MERS, officials in Florida said yesterday. One is in the hospital. The other is being monitored at home. The health care workers are among 20 in the Orlando area who may have been exposed to MERS. The U.S. has two confirmed cases - one each in Florida and Indiana - of the mysterious virus that can be fatal, and was first found in the Arabian Peninsula in 2012. 1492: Underwater explorer Barry Clifford thinks he's hit the mother lode off the coast of Haiti. Or as he calls it, the "Mount Everest of shipwrecks." Clifford believes he's found Christopher Columbus' flagship, the Santa Maria. It's one of three ships, along with the Nina and the Pinta, that discovered the Americas more than 500 years ago. If the claim is confirmed, it would go down as one of the most significant underwater archaeological discoveries ever. –Don't try this at home: It's all fun and games until someone breaks out a giant gummy bear and the potassium chloride. - Watch the birdie: What are these baby owls doing? We're not sure, but it's either kind of cute or kind of creepy? - Mother-son mashup: Welcome to today's edition of "The Best Wedding Dance EVER." - Fearless protector: This pup is determined to get the "blanket monster" under the covers. - Waxy buildup: Rep. Joe Garcia, a Florida Democrat, scraped the inside his ear during a House Judiciary Committee meeting last week. Next thing you know, he's got his fingers in his mouth. Dear CNN: We have widescreen monitors now; update your site so that the Youtube links don't cut off. Sincerely, 2014. Thanks for your note. Not sure why you're experiencing issues, but best is to reach out to our tech team. Celebs in trouble is not news. Nobody cares except themselves. These ar publicity stunts to keep them in the news. Congratulations, CNN bought in to the plan. Please stop wasitn our time and your space with pulp journalism.